Darlings, to the left you will find Juicy Couture’s utterly charming Guipure Lace Dress; to the right prepare to be tantalized by Topshop’s Sweetheart Lace Flippy Dress. While the construction of the Sweetheart Lace Flippy Dress is slightly different (Polyester / Nylon / Elastane Blend) than that of the Juicy Couture gem (Cotton); for just $98.00, as opposed to the $328.00 required to cast a glamorous spell in Guipure, it is the perfect option for le frugal fashionista looking to dazzle at forthcoming chic soirees for the holiday season – without sending her AmEx into hibernation! Thanks to Piperlime and Topshop for the pictures. Oooo, great buy! I would definitely choose the Topshop version. Topshop works for me. The lace is pretty, it gives a nice detail to this lbd. Such a pretty dress!! I love the Topshop one. Tempted to buy it for Christmas parties. I am ready to shop! For this one I think I'm ok to save, topshop is just fabulous! Mhmmm...I love the black lace dresses. Both of them...perfection! they're identical! 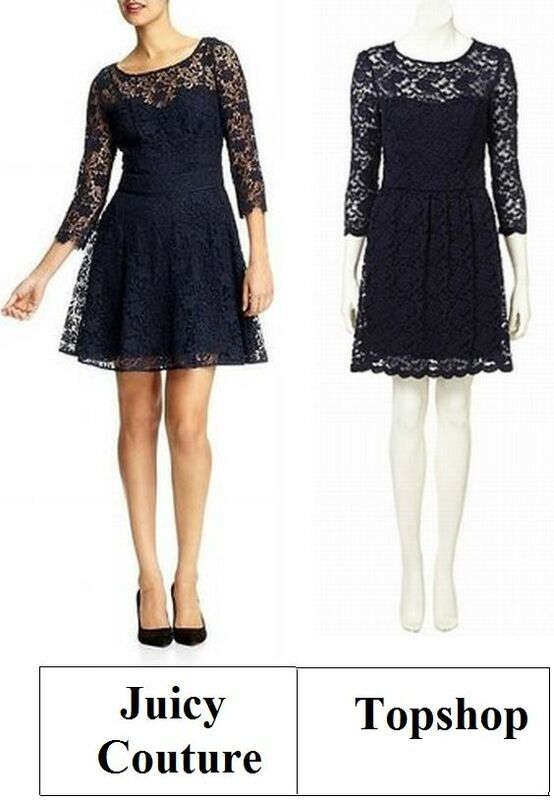 i'd definitely go for the topshop one, and it would be perfect for the upcoming christmas-parties! Oh so lovely. A sweet low price too..from Top shop! That is one gorgeous dress! I love all the stuff you post. They make great additions to my Christmas list! Either one would be so beautiful. I'm so in love with them both. Those are stunning! I love them both, but the Top Shop one would definitely be my pick. both dresses are super gorgeous!! they look almost the same, but i bet the juicy one has nicer material! Such a fabulous LBD! I love the Topshop's hem. Awesome find! This dress is just gorgeous!! Omg that Topshop dress would make a perfect Holiday dress! I've been drooling over that Juicy dress -- what a killer find! Hope you'll have a perfect week ahead!! This has to be one of the cutest LBD's I've seen in a long time. Great post and I'm inspired to find something like this for my wardrobe . . . I love a black lace dress around the holidays. Both of these are so pretty--but since it's not a dress I'd wear more than once in a great while, the Topshop one is probably the more practical option. Great find as always! congrats on being the Cecilia Wong winner--the random number picked 5 and when I saw it was you I was so excited! The silhouette and lace overlay of this dress in both versions is just perfect! I'm going to have to go with the juicy couture one though, just because I like the slight fuller look to the skirt. What a lovely dress for the holidays or a New Year's Eve Party...I love the lace! I would def go with the cheaper but still cute Topshop!